Marcia, Joe and project beneficiaries. 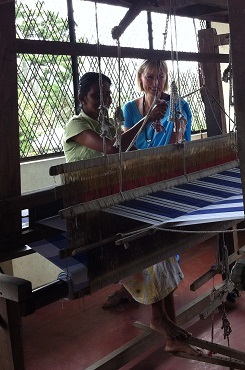 'I had the privilege of being a Shining Life volunteer this summer based for 3 weeks in the Kandy district of Sri Lanka. I was hosted by the Women's Development Centre (WDC) which is an NGO that supports children and women affected by poverty, disability and abuse. I worked alongside the Community Development Manager visiting many out-reach projects in schools, crèches and training centres in the surrounding areas of Kandy including Puparessa, Denmark Village, Ulapane and Nuwara Eliya. 'All of the projects we visited had one main thing in common and that was that the people there were dispossessed in one way or another whether this was through limited education, a disability, lack of nutrition or all too often some form of abuse. However, all appeared happy, were warm, welcoming and incredibly friendly. It was fantastic to see how well and how gratefully such small items such as pens, pencils, stationary, mini whiteboards, all donations from the UK which we took out with us, were received and how so little by UK standards, goes such a long way in making a difference to people's lives in Sri Lanka. For example, in Kadaganawa Tamil School Shining Life had purchased some very simple partitions which were used in the school to separate a very large space to create several smaller sized classrooms. This enabled groups of similar aged students to be taught together in a a discrete room with its own character and differentiated for that particular cohort. Without these partitions it must have been incredibly difficult for teachers to teach and students to learn. 'On arrival at WDC the first activity was to try to match my own personal and professional skills to the needs of WDC so that I could add the maximum value whilst there and deliver training which would have both an immediate and lasting impact in supporting the development of the organisation. This involved my reading lots of reports, literature and a major external review of WDC conducted by one of its key donors. I also informally interviewed staff during the first few days and had daily informal meetings with WDC's founder and Director so that I could understand her vision. 'It was really fun for me to deliver training again after having been out of front line teaching and training for many years. I thoroughly enjoyed all the planning and preparation and the designing of the training materials and especially the delivery. I could see the difference that up-skilling staff could make to their securing funding in the future and to even better being able to support the dispossessed children and their families and the women of Sri Lanka. Joe handing out writing materials brought out from the UK. 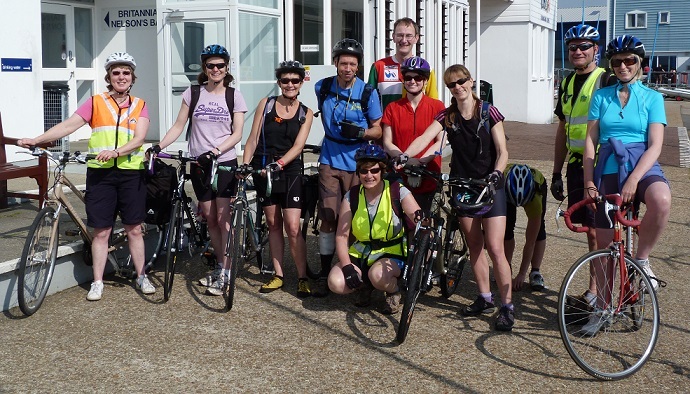 The cycle challenge took place on 18 May in almost perfect cycling weather! Sunny (for most of the day), not too hot, and not much wind. The picture shows the participants about to set off from UKSA on Saturday morning. We've exceeded our target of £5000 by well over 50%. The total raised is now just under £8000!